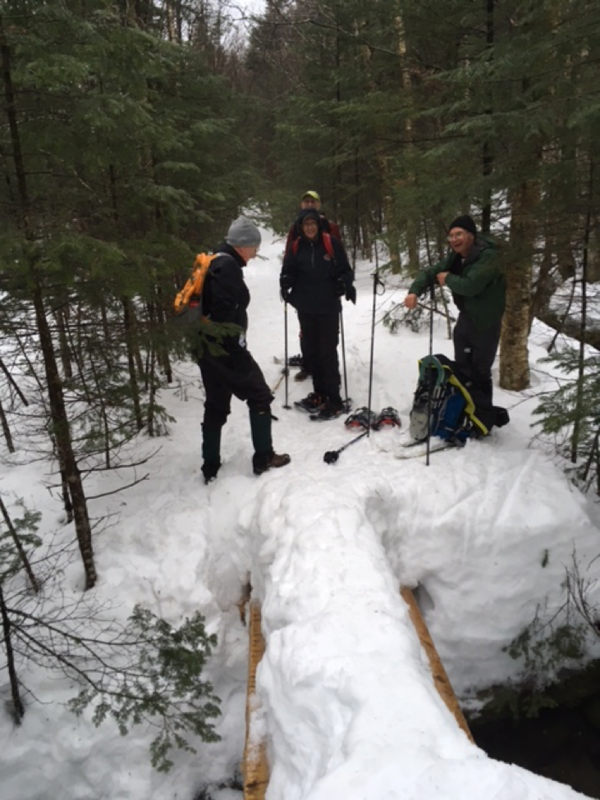 Winter weather rarely keeps the Dartmouth community from outdoor adventures. 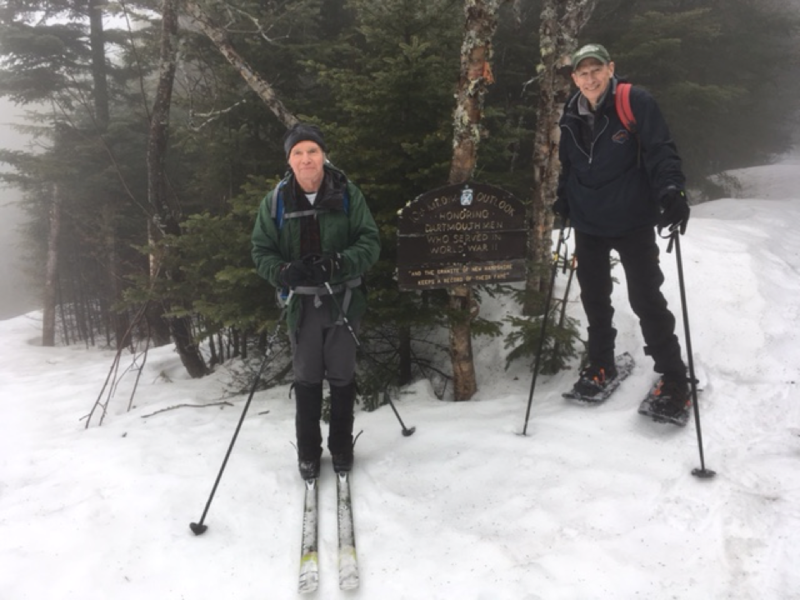 Even the most intrepid outdoorspeople, however, might not relish the thought of camping on Mount Moosilauke when four feet of snow covers its slopes. Thanks to the generosity of the Classes of 1965, 1966, and 1967, students and alumni need not forgo winter fun on the mountain for the sake of keeping their toes. 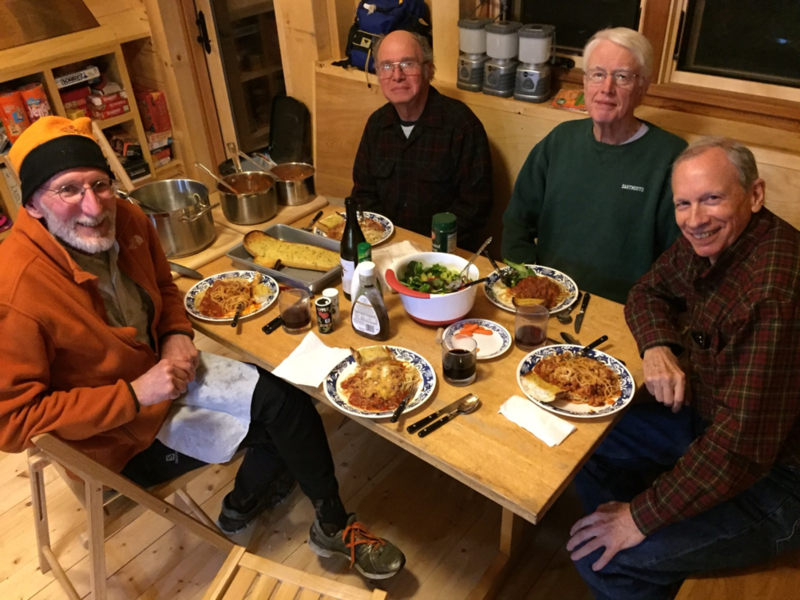 Through class projects, the Classes of 1965 and 1966 built winterized bunkhouses near the Moosilauke Ravine Lodge, which they dedicated during their 50th Reunions. 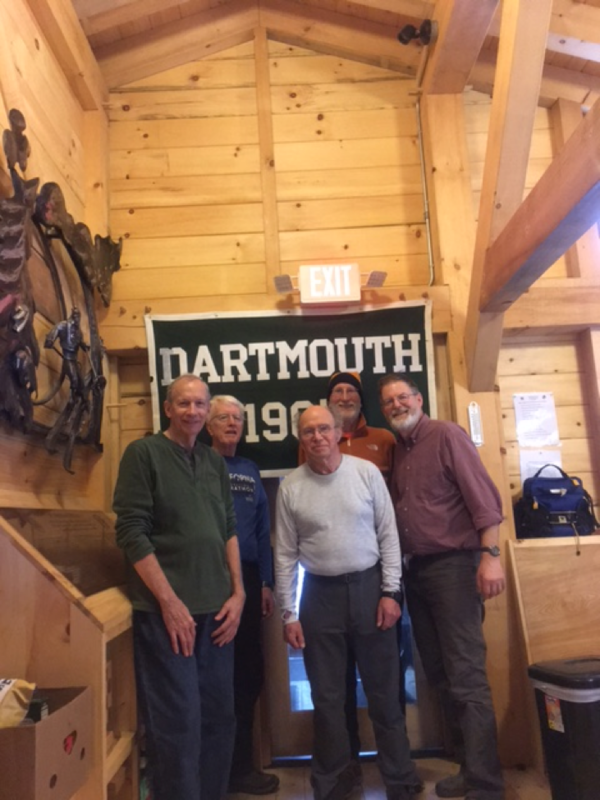 The Class of 1967 plans to complete a bunkhouse in time for their 50th Reunion this June. Equipped with gear from the Dartmouth Outing Club, classmates Hank Amon, Dave Beattie, and Mike Gonnerman, accompanied by Director of Outdoor Programs Dan Nelson ’75 and Hanover resident Bill Young, spent two days skiing, snowshoeing, and hiking on the mountain, with the class bunkhouse as home base. 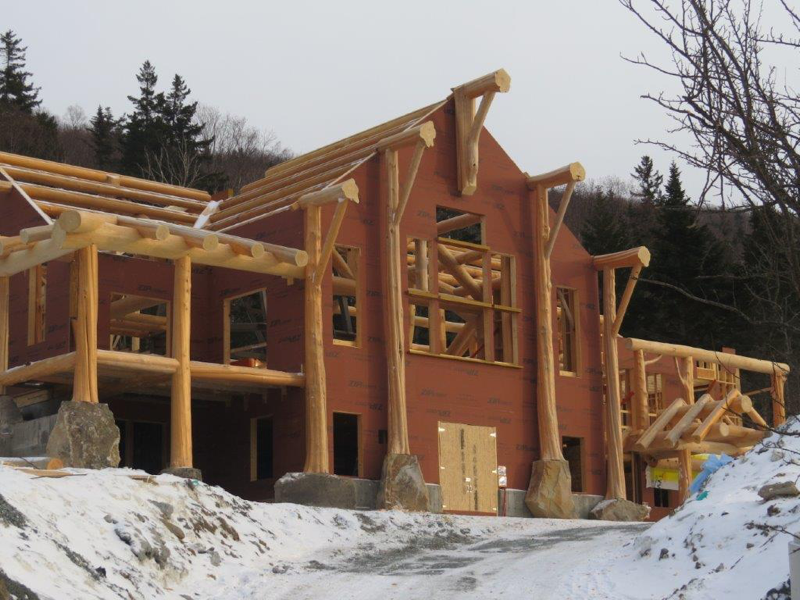 They also got a sneak-peek of the new construction of the Ravine Lodge. A thank you note left by a grateful student. 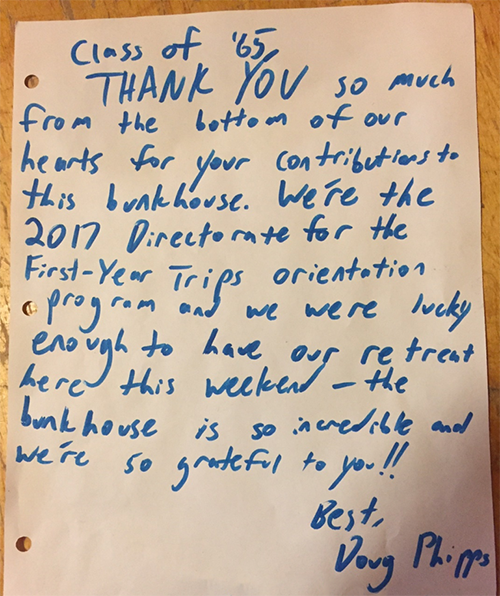 The bunkhouse has been a boon for current students as well. Members of the East, Allen, and South House Communities, along with other student groups, have also overnighted in the bunkhouse this season. Several classes, including the Class of 1965, provide funding that supports these outings. For generations of Dartmouth students, Moosilauke has been a place to build friendships and nurture an adventuresome spirit. Thanks to the warm welcome provided by alumni, students will be able to enjoy the unique magic of the mountain in winter for many years to come.